The opinion appears to be gaining ground that this very general conception of functionality, born on mathematical ground, is destined to supersede the narrower notion of causation, traditional in connection with the natural sciences. As an abstract formulation of the idea of determination in its most general sense, the notion of functionality includes and transcends the more special notion of causation as a one-sided determination of future phenomena by means of present conditions; it can be used to express the fact of the subsumption under a general law of past, present, and future alike, in a sequence of phenomena. From this point of view the remark of Huxley that Mathematics “knows nothing of causation” could only be taken to express the whole truth, if by the term “causation” is understood “efficient causation.” The latter notion has, however, in recent times been to an increasing extent regarded as just as irrelevant in the natural sciences as it is in Mathematics; the idea of thorough-going determinancy, in accordance with formal law, being thought to be alone significant in either domain. In Presidential Address British Association for the Advancement of Science, Sheffield, Section A, Nature (1 Sep 1910), 84, 290. You frequently state, and in your letter you imply, that I have developed a completely one-sided outlook and look at everything and think of everything in terms of science. 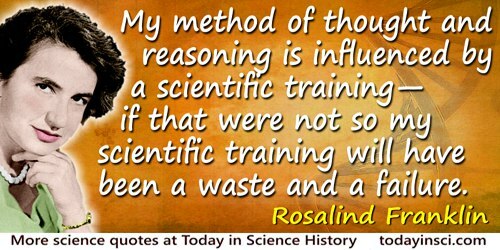 Obviously my method of thought and reasoning is influenced by a scientific training—if that were not so my scientific training will have been a waste and a failure. Letter to her father, Ellis Franklin, undated, perhaps summer 1940 while she was an undergraduate at Cambridge. Excerpted in Brenda Maddox, The Dark Lady of DNA (2002), 60.